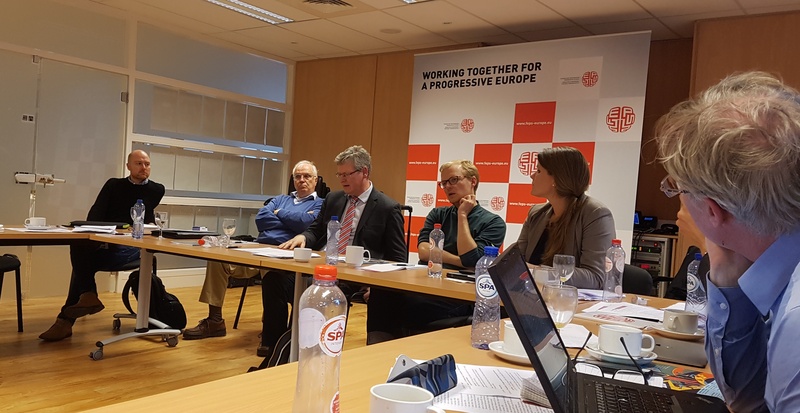 On Wednesday 11 October, many of the SPERI team gathered in Brussels to participate in a one-day workshop entitled ‘Inequality, Growth and Social Democratic futures in a dividing Europe’. They were joined by an esteemed assortment of policy-makers, political advisers, think tank colleagues and fellow scholars. The workshop, organised jointly by SPERI, Policy Network and the Foundation for European Progressive Studies (FEPS), was the fourth in a series of four Events|News as part of the project ‘Diverging Capitalisms? Britain, the City of London and Europe’. The aim of the project is to consider the changing nature of the British economy, its changing place within the European economic space and potential post-Brexit routes forward. The event’s attendees debated the future of European social democracy in the context of Brexit and evolving European economies, the national and supranational scales at which social democracy ought to be staged, and the policies and implications of the EU’s industrial policy. The first session was based on a paper presented by Prof. Ben Clift (University of Warwick), and the second on co-authored research by Dr. Laura Horn (Roskilde University) and Dr. Angela Wigger (Radboud University). The discussions were enriched by the contributions of Dr. Amandine Crespy (Université Libre de Bruxelles) and Jakob von Weizsäcker MEP (Group of the Progressive Alliance of Socialists and Democrats in the European Parliament) who served as discussants. This was followed by a panel discussion chaired by Peter Goodman (The New York Times, European Economics Correspondent) with representatives of each of the participating research organisations; Prof. Colin Hay (SPERI), Dr. Ernst Stetter (FEPS) and Dr. Patrick Diamond (Policy Network). Closing remarks were offered by former EBRD Board Member and EU Commissioner for Employment, Social Affairs and Inclusion, Prof. László Andor. This event was preceded in the Diverging Capitalism series by two workshops at the offices of Policy Network on The City after the Crisis and EU economic governance since 2008 and one prior workshop at FEPS on Brexit and the UK Growth model.